It may not offer trendy curves or a wafer thin design, but the Samsung PS51F8500ST plasma - part of the brand's Series 8 range - is a screen for discerning videophiles. It combines a high-quality picture performance with a forward-looking feature set and a design that's decidedly grown-up, but does it do enough to make it into our list of the best TVs to buy? 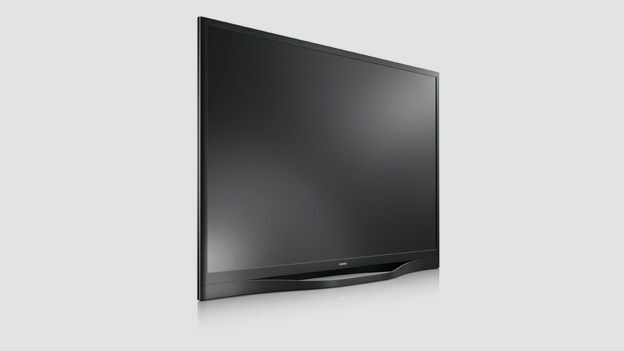 The 51-inch set featured here is also available as the 64-inch Samsung PS64F8500ST. There's nothing missing from the roster of this plasma TV. The latest iteration of Samsung's Smart Hub portal offers access to VOD, photo and music playback, social interaction and loads of apps. The user interface is easy to navigate, but isn't exactly demur in the amount of content thrown onscreen. Samsung currently remains the only set maker to provide a full set of mainstream catch-up TV services, and there's plenty of additional streaming video on tap, both free and pay. Two remote controls are provided, a fancy touch-pad, which supports voice and motion control (it's still hokey, so don't get excited) and a standard IR zapper. The latter is particularly directional, and on our sample had to be pointed directly at the IR sensor at the bottom left of the screen to work reliably. While not the thinnest flatscreen on the catwalk, there's something undeniably classy about the livery of this Series 8 model. The bezel and sculptured Metal Flow stand are gun metal grey, while the edge of the frame is chromed. It both looks and feels reassuringly substantial. The audio system is downward firing, so there are no visible speakers. Centred on top of the screen is a pop-up face recognition camera with integrated microphone. Two pairs of Active Shutter 3D glasses are bundled. Connectivity is comprehensive. You get four HDMIs, plus a mini-jack in for component and composite video (adaptor supplied). In addition to an Ethernet port, there are three USBs, one of which supports an HDD for timeshifting duties. There's also an optical digital audio output for use with a soundbar or home theatre package. As we've seen on Samsung's LED TVs, there's also provision for a Smart evolution upgrade kit, which could be used to update the TV's processor and graphical capabilities in the future. The screen sports offers twin terrestrial and satellite tuners. Samsung traditionally hides its plasma displays under a bushel, but there's nothing meek about this screen's performance. Image fidelity is fabulous. The panel's 600Hz subfield motion drive makes for naturalistically sharp pictures with excellent motion resolution, which makes it ideal for both sport and movies. Although bright, the screen really comes into its own when the lights dim. At this point, the picture becomes effortlessly dynamic. The TV's Real Black Pro graded panel offers an outstanding black level performance, with a perfect grayscale. Deep blacks are supported by plenty of shadow detail, which adds convincing depth to images. Colours are rich and fruity. This Series 8 plasma is a TV for picture quality pedants. Boasting a superb black level performance, bold deep colours and excellent definition, it suits all types of content. And as it's a PDP display, there are no backlight uniformity issues to distract. We still remain unconvinced by either voice or motion control, but the set's online network functionality is top notch, with a wide variety of catch-up and streaming VOD available. Samsung's Allshare functionality also does a good job playing multimedia files from a networked NAS as well as local USB. Factor in the refined design and the PS51F8500ST can be considered a smart set that warrants its premium price tag.